Our father among the saints Ignatius the God-bearer of Antioch (probably died AD 107) was the third bishop of Antioch, after the Apostle Peter and Euodios, whom Ignatius succeeded around AD 68. Ignatius, who also called himself Theophorus ("God-bearer"), was most likely a disciple of both Apostles Peter and John. Several of his letters have survived to this day; he is one of the Apostolic Fathers (the earliest group of the Church Fathers), and a saint in the Orthodox Church (feastday, December 20). He was arrested by the Roman authorities and transported to Rome to die in the arena. They hoped to make an example of him and thus discourage Christianity from spreading. Instead, he met with and encouraged Christians all along his route, and wrote letters to the Ephesians, Magnesians, Trallians, Philadelphians, Smyrneans, and Romans, as well as a letter to Polycarp, who was bishop of Smyrna and a disciple of John the Evangelist. These letters proved to be influential in the development of Christian theology, since the number of extant writings from this period of Church history is very small. They bear signs of being written in great haste and without a proper plan, such as run-on sentences and an unsystematic succesion of thought. Ignatius is the first known Christian writer to put great stress on loyality to a single bishop in each city, who is assisted by both presbyters (priests) and deacons. Earlier writings only mention either bishops or presbyters, and give the impression that there was usually more than one bishop per congregation. Ignatius also stresses the value of the Eucharist, calling it "a medicine to immortality." The very strong desire for bloody martyrdom in the arena, which Ignatius expresses rather graphically in places, may seem quite odd to the modern reader, but an examination of his theology of soteriology shows that he regarded salvation as being from the power and fear of death. So, for him, to try to escape his martyrdom would be to fear death and place himself back under its power. Nowadays only shorter variants of those seven letters are thought to be authentic writings of Ignatius. Their longer variants are thought to be emendations from the fifth century, created to postumously enlist Ignatius as an unwitting witness into certain theological fights of that age, while the other letters bearing his name and the purported eye-witness account of his martyrdom, are thought to be pure forgeries from around the same time. "As a pilot calls on winds and a storm-tossed mariner looks homeward, so the times call on you to win your way to God. As God's athlete, be sober; the stake is immortality and eternal life." you became a successor to their throne. even to the shedding of your blood. 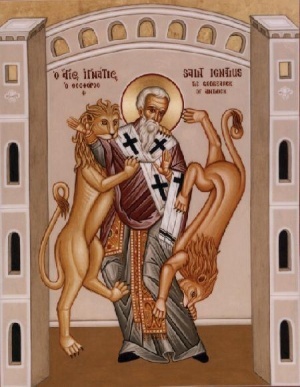 Hieromartyr Ignatius, entreat Christ God to save our souls. Is an announcement of the One who is to be born of the Virgin. You hastened to be devoured by the wild beasts. Therefore, O glorious Ignatius, you were called the bearer of God! This page was last edited on December 21, 2016, at 01:35. This page has been accessed 82,772 times.